It’s no secret that the Willamette Valley is famous for its pinot noir. With more than 500 wineries and counting, the valley is a destination for wine connoisseurs from around the globe. With so many great pours to choose from, there are bound to be some hidden gems ripe for discovery. Junction City is one such happy surprise, tucked away between the Coast Range and the Willamette River just north of Eugene. Here’s your guide to sipping wine around Junction City. Pfeiffer Winery: With 70 sprawling acres of pinot noir and pinot gris vines, Pfeiffer Winery offers myriad ways to experience Willamette Valley wine, from private to party-like. Step into the candlelit cave of a tasting room to enjoy the “Pinot Clinic,” a guided tasting of the Blue Dot Reserve vintages with winemaker Robin Pfeiffer. Or rent the pavilion with its great stone fireplace and floor-to-ceiling windows for merrymaking with many. Wind down with a stroll through the tranquil water garden or whoop it up with a hayride out to the tasting tent. Bring a picnic in the summer and roast marshmallows in fall and winter. Pfeiffer has a setting and a wine for every mood — rosé, chardonnay, pinot gris, pinot noir, merlot and port. 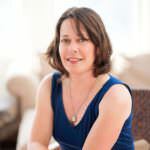 Walnut Ridge Vineyard: Walnut Ridge Vineyard owners Wendy Golish and Jim McGavin have a strong commitment to sustainable farming, evident in their practice of dry farming and hand-tending 25 acres of vineyards in Junction City. In addition, Walnut Ridge is certified sustainable, LIVE certified (Low Input Viticulture and Enology) and certified Salmon-Safe. 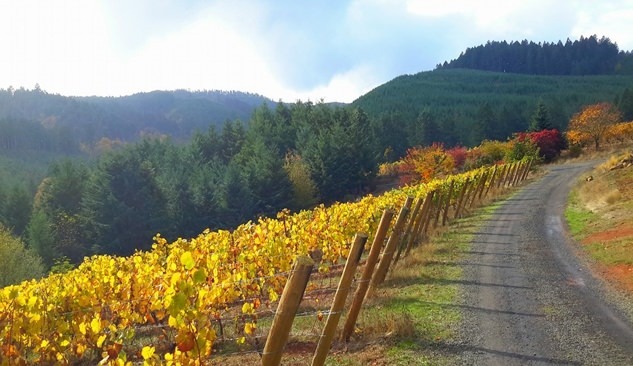 The southwest facing slopes of pinot noir and pinot gris grapes, surrounded by 55 acres of forest and pastureland, offer tremendous views of the Cascade mountains, the Coast Range and neighboring wineries. Visit the quaint tasting room, designed in an 18th-century French Colonial style, for a glass of pinot noir or sauvignon blanc with a small charcuterie plate. Benton-Lane Winery: Benton-Lane Winery owners Steve and Carol Girard were high school sweethearts who fell in love with Oregon pinots and eventually with the Sunnymount Ranch, 1,860 acres of a former sheepherding ranch in the foothills of the Coast Range. With 142 acres of pinot noir, pinot blanc and chardonnay vines, the Girards offer estate-grown wines that have won more Top 100 Wines of the Year mentions than any other Oregon still wine since 2005. Relax on the broad patio with gorgeous vineyard views or enjoy a flight in the welcoming tasting room. For something special, reserve a two-hour tasting with the owners. High Pass Winery: Winemaker Dieter Boehm purchased the 20 south-facing acres of High Pass Winery in 1984. Within just a few years, his grapes were sought after by other Willamette Valley winemakers. Boehm keeps production small by choice so he has a hand in every step in the process, from planting and pruning to aging and bottling. The rustic tasting room, overseen by his wife, Fridah, is the perfect setting for a glass of riesling, rose or pinot noir. Rent the covered outdoor patio for your own party, and check the website for special events. 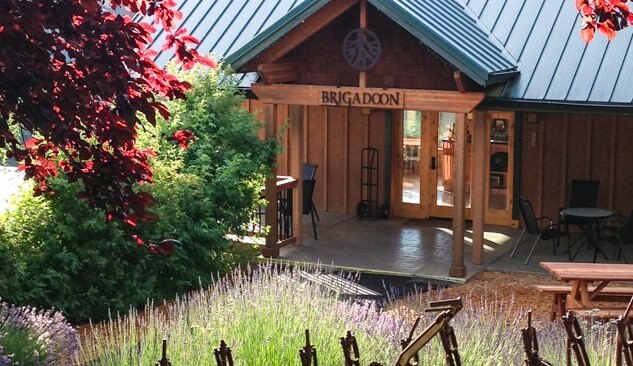 Brigadoon Wine Company: Winemaking at Brigadoon Wine Company is a family affair, with owners Sheree and Chris Shown working alongside their sons Matt and Nick (winemaker and jack-of-all-trades, respectively). Tucked away in the shelter of a secluded canyon, the 66-acre farm is home to pinot noir, riesling and pinot blanc vines, as well as a herd of sheep and a fruit orchard. Enjoy a flight in the intimate tasting room with breathtaking views of the property. Kick back at a picnic table in the garden and watch the surrounding forest come alive with birds and wildlife. Extend Your Stay: Book a room at the Territorial Bed and Breakfast and Barn, a cozy Junction City farm stay. Territorial is family-friendly, pet-friendly, bike-friendly and even horse-friendly with a guest barn for visitors’ horses.